Whether you’re storing an entire home’s worth of goods or you’re just storing some decorations and seasonal clothing, it’s important to find the right storage unit that will accommodate the amount you’re storing and the types of items you’re storing. This guide will help you find the right storage unit size for you. When you’ve decided on the type of storage unit you need, contact Just Store It! to reserve your space and get your items moved. Before picking out a storage unit, take a look at everything you need to store. It helps to put as many of those belongings as possible in one place so you can visually see how much space they take up. The size of storage unit you need will depend not only on what how much you’re storing, but also on how you’ll be accessing it. If you’re storing items for an extended period of time until you find a home you can move everything to, you can choose a smaller unit that you can pack completely full. If you’re storing items that you’ll want to have access to regularly, you’ll need a larger space that you can walk through and find items in. 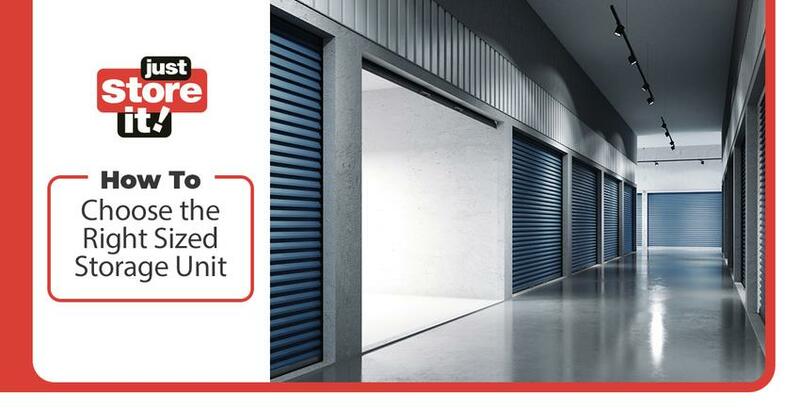 Many storage facilities have demo storage units or empty units that you can check out before deciding on the size of unit you’ll need. If you have a specific size in mind, ask to view that size — as well as one size up and one size down. This can help you visualize how you’ll pack your belongings in each space. The dimensions given for the storage unit is the width and depth, but you’ll also want to take the height of the unit into consideration as well because you can stack boxes and furniture. A standard ceiling height for many storage units is 8 feet, allowing you to stack 4 or 5 boxes on top of each other and some boxes on sturdy furniture. Furniture built for storage, like bookshelves, can be used to stack boxes and belongings on to maximize floor space. Some furniture, like couches and beds, can be stored sideways. This is another way to maximize floor space for other items that need to stay upright. Many storage facilities offer a size guide to give you a better idea of what will fit into a space. At Just Store It!, we offer helpful tutorial videos that help you visualize what will fit in a 5’x5’ locker, an extra-large 10’x30’ unit, and everything in between. Check those videos out, and keep reading to get a better idea of what will fit in our storage units. This is our smallest unit available and, though it seems like it wouldn’t fit much, you can store a variety of miscellaneous or seasonal items in this storage unit. Store holiday decorations, seasonal clothing, office supplies, and even small pieces of furniture. This unit is also great for outdoor gear during the off-season. A storage unit this size is perfect for storing contents from a single room in your home. You can store bedroom furniture, extra clothing, office furniture, and files. This size is also great for dorm storage so you don’t have to take all of your belongings home during summer break. Either of these storage unit sizes are great for larger areas of your home that have more items and more furniture. They can store living room furniture and decorations, a couple bedrooms’ worth of furniture, or even some kitchen furniture and appliances. We have a couple different sizes available to accommodate how full or light you want to pack your storage unit. Storage units this size have 150 square feet of storage space. These units are best for large pieces of furniture and appliances. Store things like big-screen televisions, large dining tables, sectional sofas, and refrigerators. The contents of three bedrooms will fit well into this space. You’ll be able to fit a three- or four-bedroom house’s worth of belongings in this space. You can pack large furniture, a washer and dryer, refrigerator, living room electronics, and even workout equipment. This storage unit is best for families that need to store all of their belongings during a move or for the contents of smaller homes that need to be accessed regularly. If you need to store absolutely everything you own from a five-bedroom home, including a vehicle, this extra-large unit is perfect for you. If you need to store all of your furniture, appliances, clothing, gear and equipment, and a car, this storage unit will fit it. A 10’x30’ unit is roughly the size of a one-and-a-half car garage, if that gives you a better idea of how much space you’ll have with one of these units. If you’re still unsure what size to get, going bigger in size is better than going smaller. You wouldn’t want to load most of your belongings into a space only to realize not everything will fit and then having to move everything again into a bigger space. If you’re in need of a storage unit in Johnson City, contact Just Store It! We’ll provide you with all of the information and resources you need to choose a storage unit that’s right for you.